When you have the chance to buy a classic of golf literature, you should. 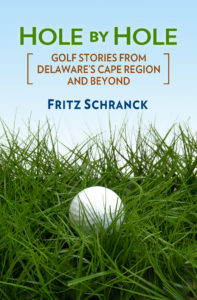 You might find yourself lucky to find a copy at an old second-hand book shop–or you might have to wait until some enterprising book publisher remembers that some golf books are worth keeping in print. 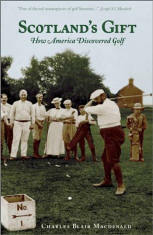 Thanks to Tatra Press’s reissue of Scotland’s Gift: How America Discovered Golf, for example, you can read again the reminiscences of Charles Blair MacDonald, one of the most influential American golfers of the nineteenth and early twentieth centuries. ($26.95 SRP). MacDonald (1855-1939) was among the first American golf course architects. Nonetheless, his seminal involvement with golf was far more extensive than his remarkable creations at The National Golf Links of America on Long Island, the Yale University golf course, or the famous Mid-Ocean course in Bermuda. Among other highlights, he was a founding member of the United States Golf Association. He served for many years as a Rules Committee member of the Royal & Ancient. He also won the first United States Amateur championship in 1895. Most important, MacDonald was among those rare individuals who were not only active participants, but who could also write well about their interests. MacDonald took this opportunity to preach the benefits and intricacies of his favorite sport, from his unique perspective as one who was present at the creation of the primary American organization devoted to golf. Some modern-day readers might think that the USGA was the only such entity, but MacDonald traces the influence of the Western Golf Association and the differences that arose between the two groups. MacDonald, who made his first pile at the Chicago Board of Trade and helped found the Chicago Golf Club, was sensitive to the topographical and other differences between the “Westerners” where he lived and the more Eastern orientation of the USGA. MacDonald recounts several of the controversies in which he played a significant role in coordinating and compromising between the two. MacDonald tried constantly to keep the American style of golf as close as possible to the game he played as a university student at St. Andrews, when he competed with some of the leading Scottish golfers of the time, including Tom Morris, Jr. and David Strath. In this respect his unpaid work in designing courses was invaluable. MacDonald played most of the famous layouts in Great Britain and took careful notes. He then obtained surveys and recreated some of the better features of some of the best holes where he could. His respect for how a course should look and play stood in stark contrast to some other designs inflicted on America in the early days of modern golf. Fortunately, MacDonald helped convince new clubs and their owners to pay attention to these fundamentals, and avoid some serious design mistakes. MacDonald often succeeded in pushing his own agenda, but not completely. For example, MacDonald clearly thought the stymie rule was critical to the game’s integrity. The WGA was strongly against it, however, and eventually won out over MacDonald and other traditionalists. At other points MacDonald refers to starting an early morning round with friends only an hour or so after returning from an evening. From such offhand remarks one can learn much. Anyone interested in how American golf developed from its Scottish origins should read this book. It not only fills in many of those blanks, but also gives an intriguing glimpse into America’s social history from the perspective of one of its primary contributors.